Snow-capped mountains peek above the clouds in the distance, overlooking the chaotic mess of traffic and smog left far below. 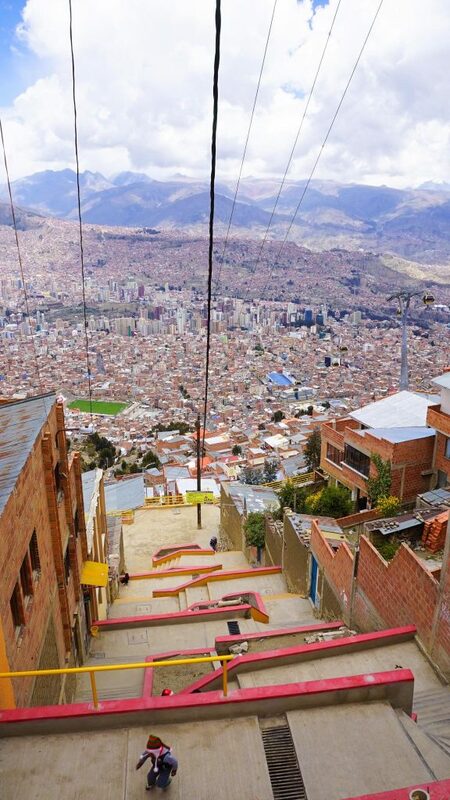 Throngs of tiny, tiny people go about their daily life – unaware of the silent observers looking on from above on the La Paz Cable Car in Bolivia. This is now a daily reality of life here in Bolivia’s administrative capital, and nearby El Alto – the world’s highest metropolis which spread across the cliffs above 4,150m. 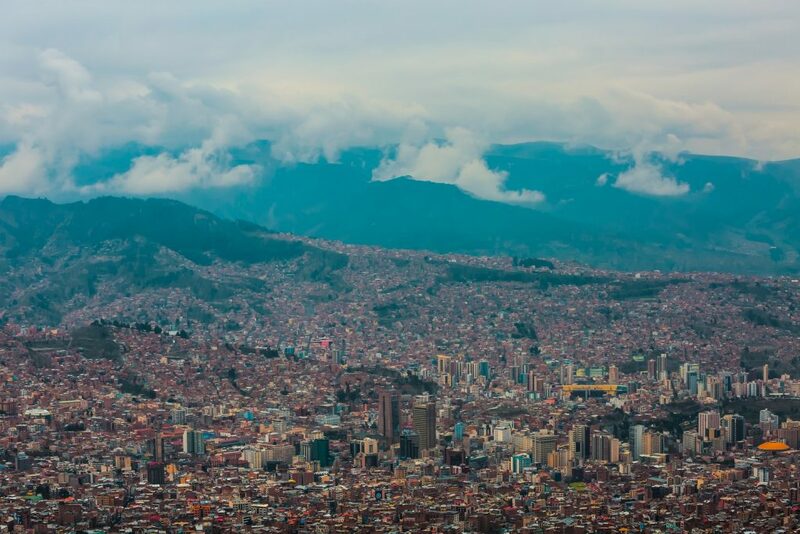 Thanks to the vision of Bolivian President Evo Morales Ayma, in 2014 the worlds largest, and highest, aerial cable car urban transit system became operational – beginning with three lines but with a further seven planned or currently under construction. There really is nothing else in the world like it – nor a city so uniquely suited for such an ambitious project. 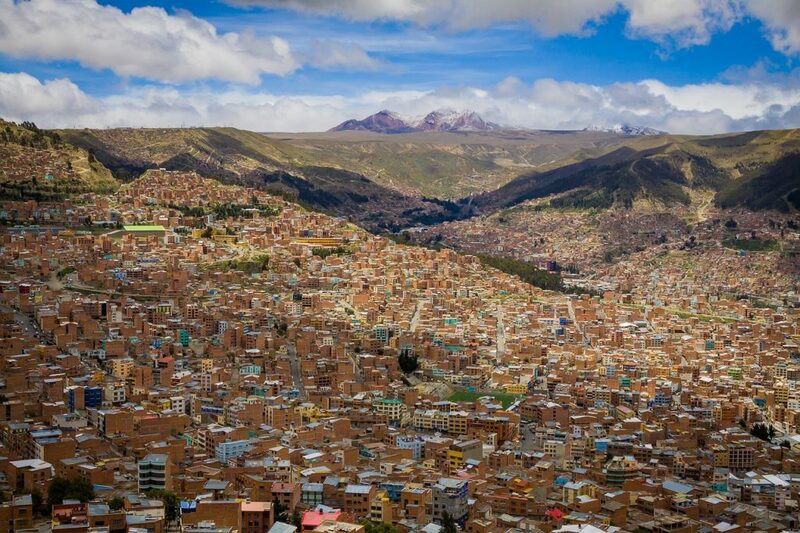 Situated in a deep valley high in the Andes, La Paz is steep, over-crowded and absolutely chaotic, but when you are soaring high above its thousands upon thousands of ramshackle terra-cotta-red buildings it takes on an almost beautiful quality. 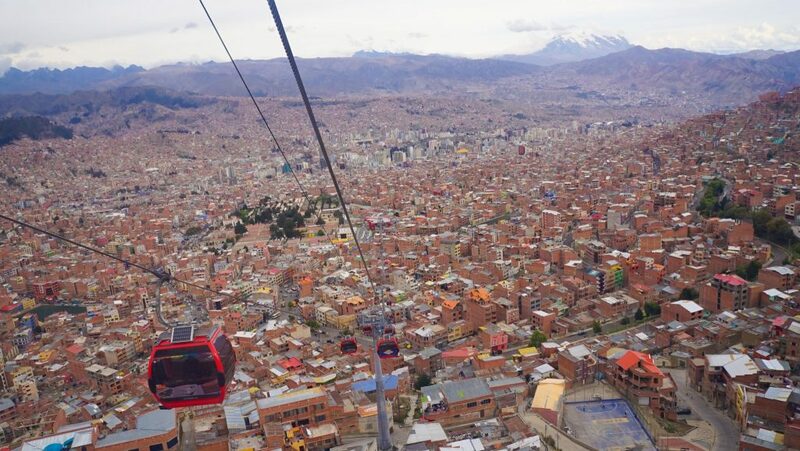 La Paz Cable Car in Bolivia – The Worlds Coolest Public Transportation? 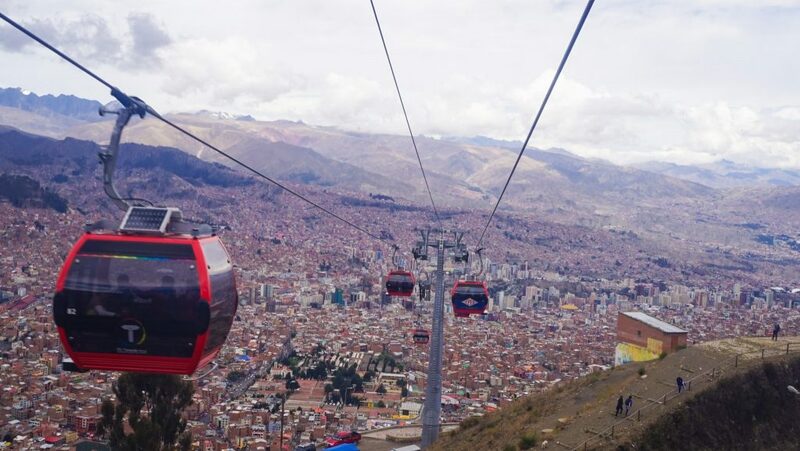 The La Paz Cable Car in Bolivia is the world first example of cable cars being used as a primary transport network rather than connecting to a larger network of subways or trains. In contrast to the surrounding narrow streets, uninspired architecture and gritty atmosphere the new cable car stations are a beacon of modernity in this fast developing country. 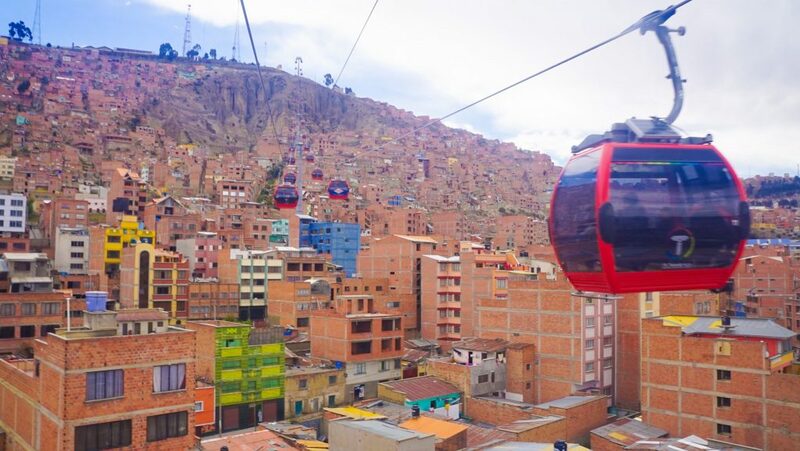 Futuristic, clean, high-tech and grand – the La Paz Cable Car was designed for the city La Paz wishes to become. Upon entering the eight-person cabins, you are enveloped in silence. Free WiFi is provided but the views will be enough to keep you entertained for hours – a bird’s eye view of the ground below. It is surreal and refreshing to see a city from a completely new angle and grasp just how big and sprawling this city truly is. Discover the best early-bird hotel options in this chaotic sprawling city! As of March 2018, the La Paz Cable Car in Bolivia (locally known as the Mi Teleférico system) consists of the Red Line, Yellow Line, Green Line (the colors of the Bolivian flag) + a blue, orange and white! Best Places to Eat in Sucre: Buen provecho! 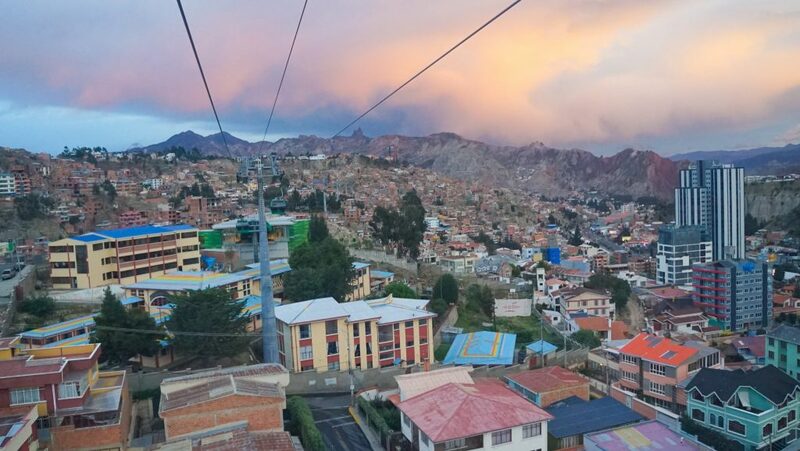 A ride on the La Paz Cable Car in Bolivia cost 3 BOB for each ‘line’ and there are no transfers, with each segment taking 20-30 minutes to complete. We honestly couldn’t find much else to interest us in La Paz and found ourselves riding these bad boys all day long. In particular, make sure to go to the top end stations on the cliffs of El Alto to have a panoramic view of the city below – Head up there for sunset and return in darkness. There really is nothing like pulling out from the station and watching as a million lights glisten as you drop back down to La Paz. There are plenty more awesome things to do in Bolivia...So don't miss out on having the full guide with you! So what do you think? 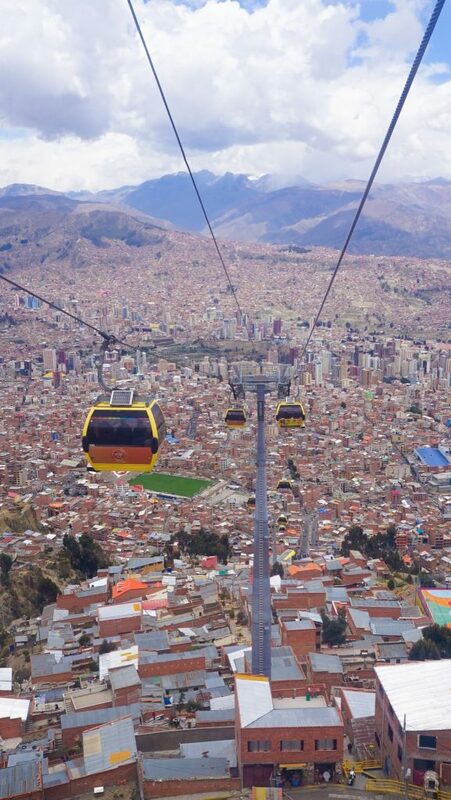 Is the La Paz Cable Car in Bolivia the worlds coolest public transportation? Have you been, or are you now inspired to check it out? 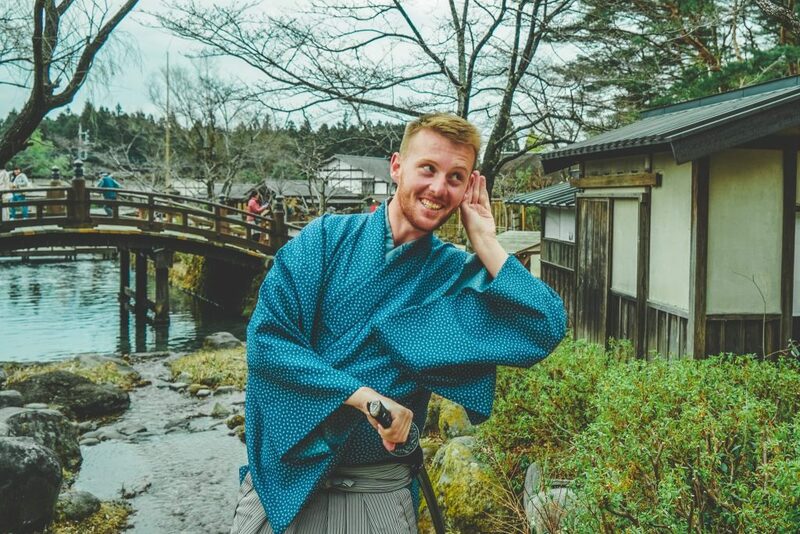 Let me know what you think in the comments below and let others know what else they should be seeing in La Paz! 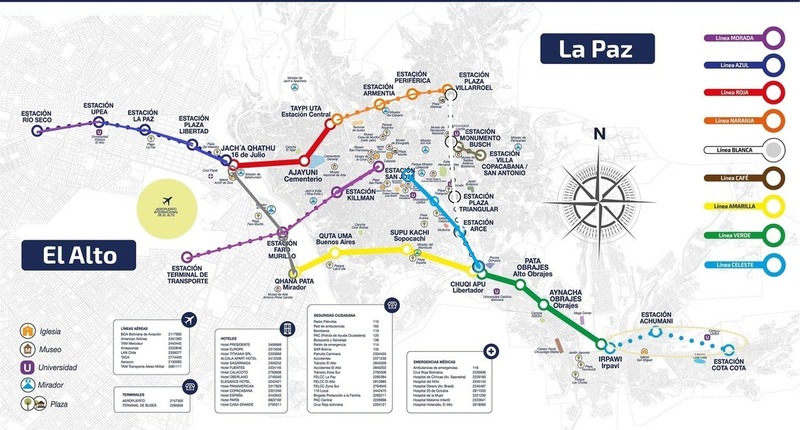 Oh – and if you get an update of the La Paz cable car map please do me a favor and send it through! And don’t forget to check out Bolivia Hop for a cool backpacker bus route through Peru!